Their coach has vowed to continue the raffle as a teachable moment for his 9-year-old charges after receiving a backlash of hate on Facebook this week. 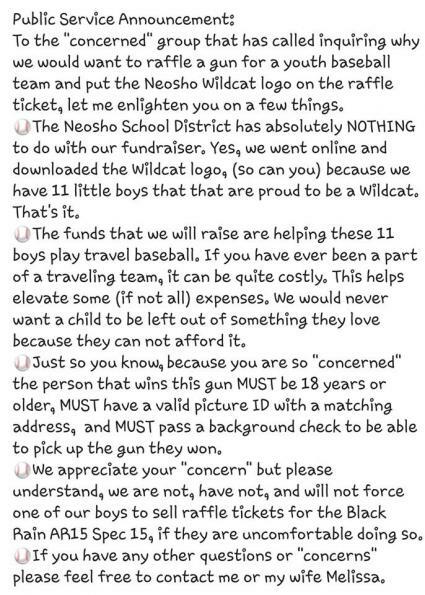 Third-graders in a Missouri community are continuing to sell raffle tickets for an AR-15 to benefit their traveling baseball team after the same type of rifle was used to slaughter and injure dozens at a Florida school. Levi Patterson, the coach of a 9-and-under baseball team in Neosho, Mo., told The Star the idea was conceived before the shooting in Parkland, Fla.
A father of one of the players — who co-founded Black Rain Ordnance Inc., a weapons purveyor in Neosho — offered the weapon for the raffle. “One of the people from the hate group turned in (a Facebook post about the raffle) for I don’t know what,” Patterson said. The post had shown a weapon next to the school logo, leading to fierce criticism by some until Facebook removed the post, according to Patterson. Patterson justified this on Facebook, saying no kids would be forced to sell the raffle tickets if they or their parents didn't want to. Bless his heart. Here's his Facebook page.